This won’t be another one of those posts where ELV rhapsodizes about the beef at Carnevino. Heaven knows, we’ve done enough of that. But the steaks trotted out by the Batali boys for a “Mad Man” Mancini interview of Zach Allen were so gorgeous, we couldn’t resist posting a few tasty snaps of them. That Shrimp Diavola app they got is truly awsome…. Holy Pretentiousness ELV. Does that place actually have some shmeckle in a Brooks Brothers suit come out and cut the f’cking steak for you? Do they have another certified, trained employee who comes out and feeds you? And another who tells you how to find taste notes in the beef? Jesus Christ this country is really going in the wrong direction; 43 million folks on food stamps, and a restaurant that trains a guy to cut $100 steaks as part of its fine dining experience. BTW where does one earn their stripes for such a gig? At Pasha and Quaddafi’s Chophouse? @vegasdave: The guy cutting the steak is Kirk the sommelier. He’s a good guy and knows his wine well. I’ll be honest, I do really enjoy this place but I really hate the super aged beef. I don’t get the blue cheesy thing and it smells like death to me. I’ve tried it a bunch of times and I simply can not get the gross anatomy lab smell out of my head when I taste it. However, if it’s not aged too much, it’s a fantastically incredible steak. Awesome wine list and service too. Re @george: As equal-opportunity steak lovers, we swing all ways. Maybe that’s why this time, the 60 day aged one was so compelling. Regardless of how you feel about the gamy, blue-cheesy thing, every thing else about CV is just as you say…and Kirk is great. 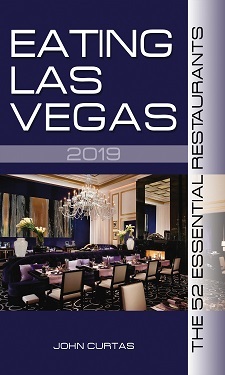 Re @vegasdave: ELV didn’t create the restaurants of Las Vegas, he just reports and comments on them. Had dinner with the wife at Carnevino about 3 weeks ago. We had the porterhouse for 2, steak tartare, and the spago pasta w/ lamb ragu. The overall experience was the best we had throughout our week long trip. This continues to be my favorite over the other big name steak houses on the strip. The grappa cart is also fun! surprised not to see a pic of it here.